Seeing big investment schemes come to life, knowing the hard work and commitment that has gone into them, is always rewarding. And this week I had the pleasure of looking around the initial work to transform the river bank between Bath’s Churchill Bridge and Green Park. These have been completed in the latest phase of the ambitious £6.2 million Bath Quays Waterside project. When it is finished the scheme will protect more than 100 commercial and residential properties from flooding, support the regeneration of Bath Quays, and reconnect Bath to its riverside. Another achievement was also being completed this week - the £500,000 Two Headed Man junction on the A39 at its junction with the B3116. We have worked with the West of England Combined Authority on this project which will dramatically reduce peak-time queues for the many motorists who use it. Working to improve transport and travel is a key part of ensuring sustainable economic growth across the West of England. This was highlighted at the annual travelwest Business Travel Awards, which was hosted at the Guildhall last night. The awards celebrate exceptional sustainable travel projects in organisations from the four regions within the travelwest partnership - Bristol, North Somerset, South Gloucestershire and Bath & North East Somerset. It was great to see Wessex Water, from our region, winning Organisation of the Year. Regeneration and transport were also part of discussions when I met the Bath Life Business Club earlier this week and again when I went along to meet members of Bath City Centre Action Group. 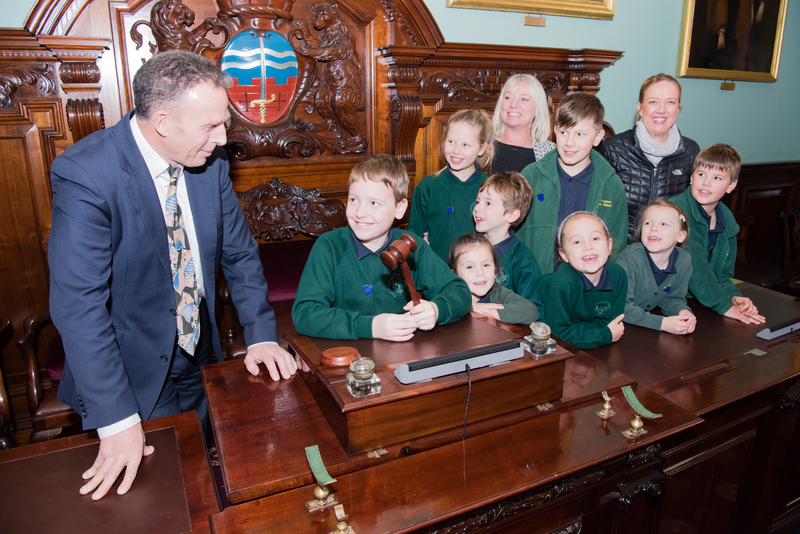 Towards the end of the week I was fortunate to take some time out to host a very special group of councillors who came to look around the Guildhall – pupils from East Harptree Primary. The children, who are school councillors, held their own meeting in the council chamber and were a real credit to East Harptree Primary.